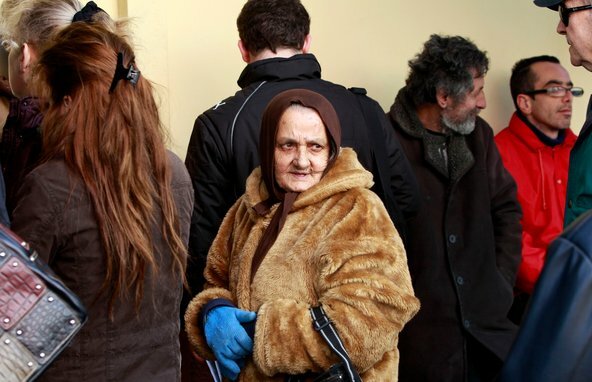 John Kolesidis/ReutersAs austerity bites, applicants lined up outside a welfare office in an Athens suburb on Friday. LONDON — In another blow to Greek pride, as the country struggles to meet its European partners’ demands for a financial bailout, armed robbers broke into a museum at the birthplace of the ancient Olympics on Friday and made off with a haul of treasures. Pavlos Geroulanos, Greece’s culture minister, was reported to have offered his resignation immediately after learning of the heist, the second major art theft this year. In January, thieves fled the National Gallery in Athens with $6.5 million-worth of art, including paintings by Pablo Picasso and Piet Mondrian. The latest theft was blamed by some on budget cuts that have been imposed on all aspects of Greek public life in an attempt to rein in the country’s runaway debt. Friday’s raid targeted the Ancient Olympia museum in southern Greece where a ceremony is scheduled for May 10 to light the Olympic flame for this year’s Games in London. When Mr. Geroulanos announced last month that he would offer cut-price permits for films and photographic shoots at monuments such as the Parthenon, he was accused of “renting out” Greece’s art treasures to cover budget cuts. Culture ministry security guards have been among the low-level public workers demanding job security and exemption from further budget cuts, in their case on the basis of the potential impact on museum security. The latest robbery will be seized on as another symbol of a breakdown of Greek society in the face of the draconian austerity measures being imposed on the country’s 11 million people. Rioting in Athens at the weekend in response to a government decision to bow to the demands of the country’s European creditors has spurred a mood of national humiliation. Some commentators say the Greeks have only themselves to blame while others suggest they should tell the European Union to get lost. Before the weekend, however, it looked as if €130 billion bailout deal will be finalized on Monday. Rendezvous is a digital meeting place for the globally engaged, hosted by the International Herald Tribune. We publish exclusive analysis of the most significant global news and showcase signature IHT features and journalists. We seek to inspire international discussion and intelligent debate that enlivens the global conversation. Join in. Robbing Greece of Its Pride – NYTimes.com.